The election year 2019 has been booming in Bollywood too. In the first week, there were two such films which had more than box office discussions in the corridors of politics. First the Accidental Prime Minister and the other Uri-The Surgical Strike Talking about Uri, the film is flagging the box office. The performance of all the actors in the film is being appreciated and the patriotism zeal shown in the film has also been appreciated by the audience. Apart from this, there is another such thing in the film that has attracted people's attention in the movie theater. That is the role of politicians in the film. After the Uri attack in 2016, the film made on a surgical strike, entered into Pakistan's home, tells the whole process of operation. Obviously, the decision of the government was also important, so too many leaders have been shown in the film. In the film, the characters of Prime Minister Narendra Modi, Home Minister Rajnath Singh, Defense Minister Manohar Parrikar (then), Finance Minister Arun Jaitley have been shown. Prime Minister Narendra Modi: The role played by Prime Minister Narendra Modi in the film is played by Rajit Kapoor. As soon as his entry is in the movie, the audience starts slogging Modi-Modi slogans in the theater and the reception is welcomed with the seats. The prime minister's character has been shown to be serious in the whole film, who is speaking less, but whenever he is speaking, he is speaking his point in critical terms. The most important scene of this character comes when the success of the surgical strike is confirmed in the film, the people sitting in the theater watching the Prime Minister breathing relief starts to slogan "56-inch" slogans. NSA Ajit Doval: The most important character of the film is Paresh Rawal, the role of NSA Ajit Doval. The film begins with the success of a surgical strike near the Myanmar border, from where Ajit Doval's MindGame is shown. This character is full of brain workout, which is not afraid to take tough decisions and is fully confident in the soldiers. During the growing terror attacks between 2015 to 2016, Ajit Doval's troubles during the attacks and the new preparations in response to the audience greatly appreciated. This character also laughed at the audience when Paresh Rawal broke his phone after every phone call. And his colleague immediately gave a new call, people hooting here. The character of Ajit Doval is given to Govind Bhardwaj. 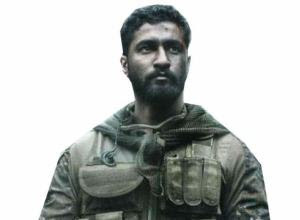 KHARA MINISTER Manohar Parrikar: The character of Manohar Parrikar, who was the Defense Minister of the country during the surgical strike, has been played by Yogesh Somen, who looks exactly like him. His character just became overwhelmed by the media, taking part in the meetings was noticed. In most of the time, the decisive decisions were made by NSA-PM only. In this case people like this character in case of look. Home Minister Rajnath Singh: After the Uri attack, in a meeting convened by the Prime Minister, when it was asked how to give a tough answer to Pakistan. All were keeping their thoughts, but when Rajnath's answer came, theater rebuked him. Actually, the answer was that we stop the water from going to Pakistan so that they will have difficulty with the LoC and the intrusion will be stopped. There was a lot to say that the people sitting in the theater started playing whistles and applause. And the conversation about the strong condemnation of every attack in the audience began. Apart from this, some leaders, officers, and officers of the army have been playing very well, which is very much liked by the audience. While watching the film, you will also get a fringe of the India-Pakistan match, where applause and seats are played on every four-sixes. The only difference here is that the seats are ringing every terrorist killed in the theater and from time to time, Bharat Mata Ki Jai and Vande Mataram slogans resonate in the theater.